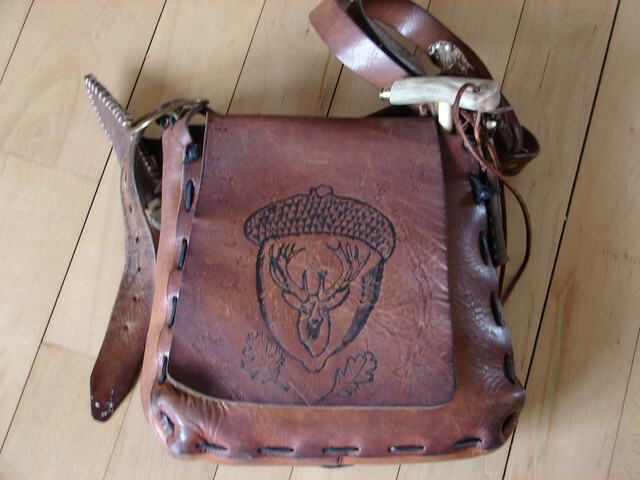 Question for the Bag Makers- I shoot alot of "Woods walk's" I mean a lot , leagues also. Anyone make a bag where the flap would fold backwards/behind the Bag to leave the bag open on Top. to make it easier to retrieve the Items inside? I don't do alot of jumpin around or cartwheels so I could shoot most of a course with it open and just reach in to get the essentials. 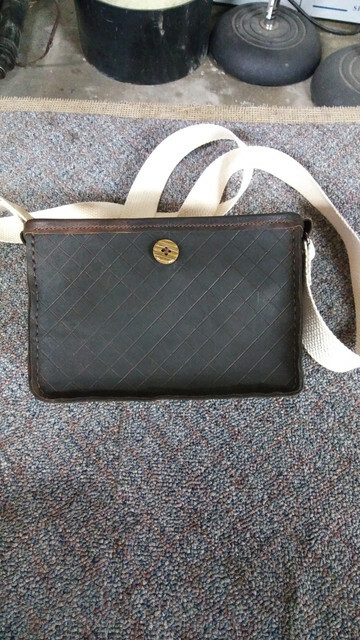 Maybe it's not period correct but Id like a shallow,( not real deep) Bag. But wide, at least 7" wide 5 1/2" deep or so? (I Got Big Hands) And a Strap with a sleeve for a Short Starter. I dont need a Knife Sheath I got a Neck Knife. That's certainly a doable scenario for your purpose. Pondering your project a bit, I think if your needs were my needs, I would make the bag open top, which there is documentation to support open top bags that close using a button sewed near the top on the inside of the back and a button hole in the front so you can button it shut when not in use. 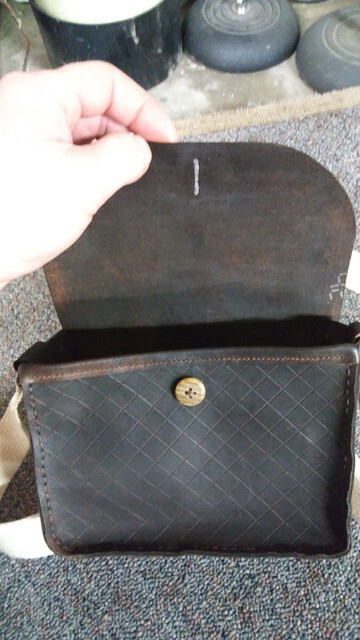 Here are a couple of pictures of an open top bag I bought from Eric Ewing. Hopefully you et the idea. I also thought of an open top but that IMO is more suited for a deeper bag than he wants. 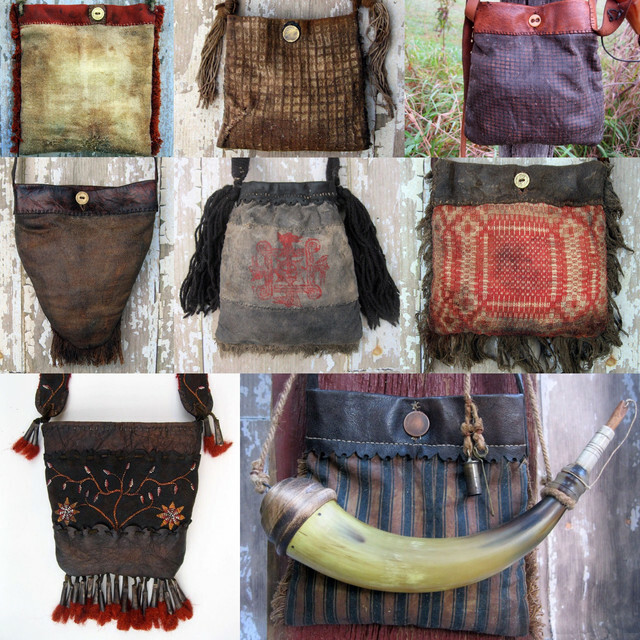 Though I have not seen a bag like I am about to describe, it would work in kudu's situation. 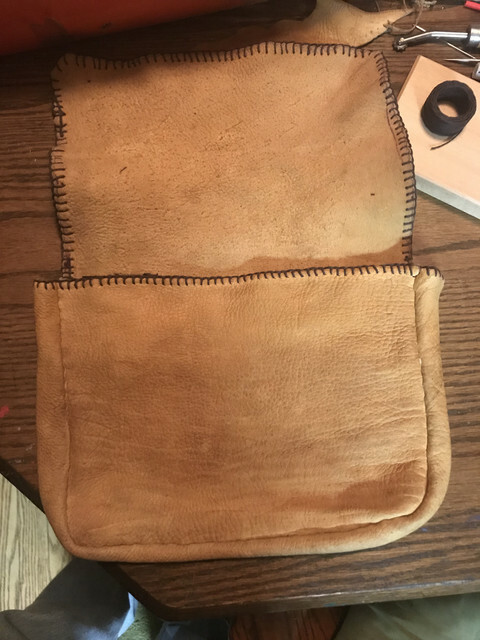 Instead of making a traditional looking flap and sewing it to the top edge of the back of the bag, make the flap extend down the outside of the back of the bag and attach it with a button like you would the front. When carrying the bag, the flap would be secured by the front and rear buttons. When you want to use the bag, unbutton the front flap and flip and rotate it out of the way. Whew, that is all the heavy thinking I am going to do today. I like most all the ideas. SLIGOBILL Thats some nice bags but like James R mentioned they look too deep hard to tell without a tape measure. a open top might be good with a low profile Button. 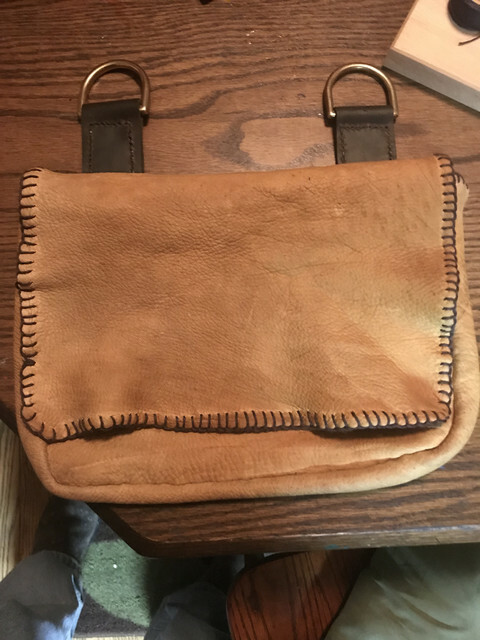 But then again a stiffer leather bag with ends sewn in (Built like a Box) a front ,back, and one piece for bottom and sides, wrapped around to the sides. you guys know this stuff I just build Guns for myself to shoot and try to win. I dont build bags. Built a horn or two and a ball snake. The lid and the back of the bag are one piece. Made of buckskin. The flap could easily be folded between ypur body and the rest if the bag. Jim Webb told me that commonly flaps were tucked to the rear when action called. Just as you noted. 1- A flexible flap easily doubled back. No need for a button, your body will hold it there. 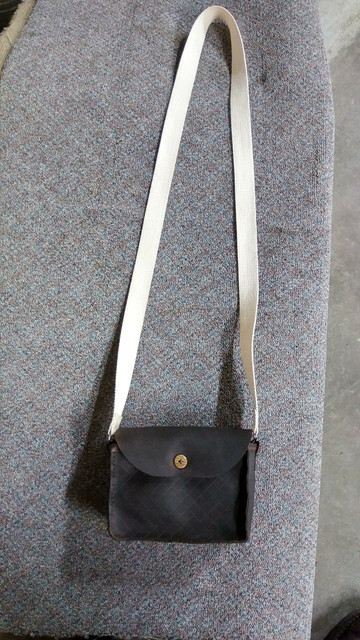 2- A strap hung from a gusset or insert on the SIDE of the bag. Straps stitched to the back will not work. Think about where the flap goes. 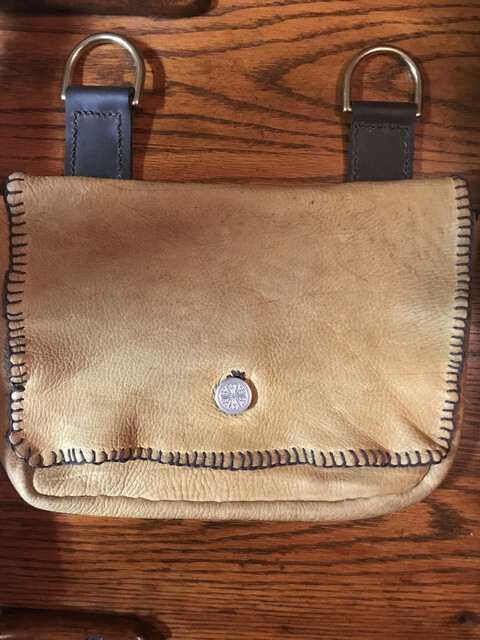 Jim Webb makes bags that would fit your needs out of deer hide. Give him a call. He’s written a book on your subject. Great man. Maybe I'm thinking too simplistic but what if you simply shove the flap down into the bag and press it against the inside back? Any chance something like that would work? 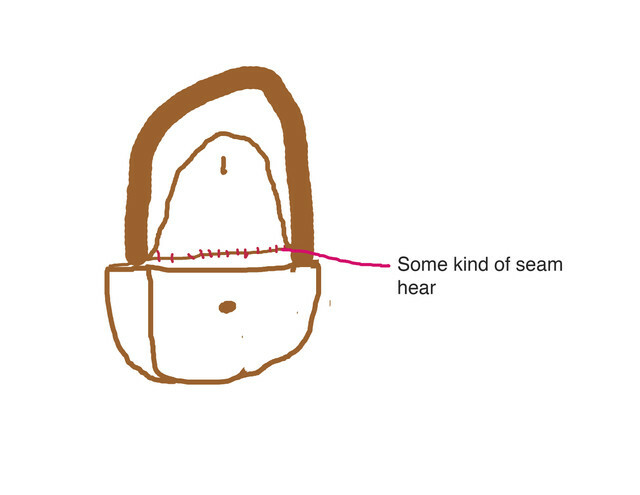 If the strap is attached to the back as many are, it seems that flipping the flap over would not work well. And Eric, I LOVE your bags!! As I stated I wanted a bag with a flap that could be folded to the back. Also I wanted a Cloth Strap /BECAUSE I have a leather strap that turns my shirt orange brown in a cross ways stripe in the summer. That’s a nice job! Lots to like on that one! What’s next? WOW Eric, you are stirring my interest once again on those open top pouches. I can see where they would be very handy on a woodland walk or a hike with gun squirrel hunt. They were used quite often here in Appalachia. "Also I wanted a Cloth Strap /BECAUSE I have a leather strap that turns my shirt orange brown in a cross ways stripe in the summer." Kudu, I hear you. 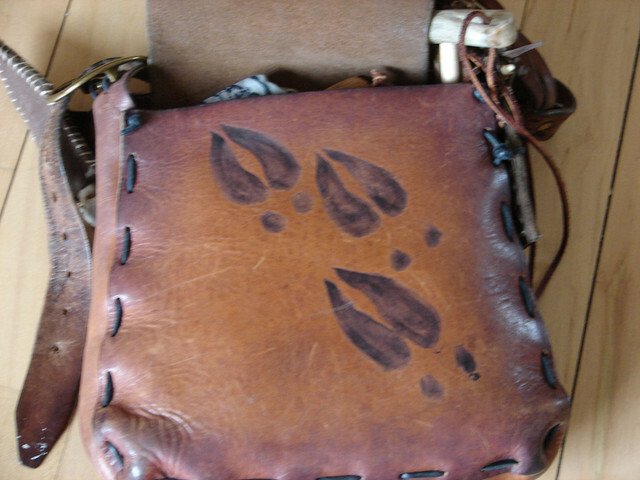 One of my goals in making leather is to make sure that no dye transfers to anyone's clothes. My dad made a holster 40 years ago that dyed a customer's dash on his pickup, so he warned me when I started. It has taken a TON of experimenting to get something that I am happy with. Some folks have poked at me for not dark finishing the back of straps. That is the reason. I cannot get a dark solid dye to take on the reverse without transferring when someone sweats or gets caught in the rain. I do a light tan alcohol thinned dye on the reverse, and that seems to hold fine. Gives a nice color too. Here is my tip for you all: Spray the suede side with Kiwi Suede Protector. You can get it at the grocery store or Walmart. It is like Scotchguard for leather. 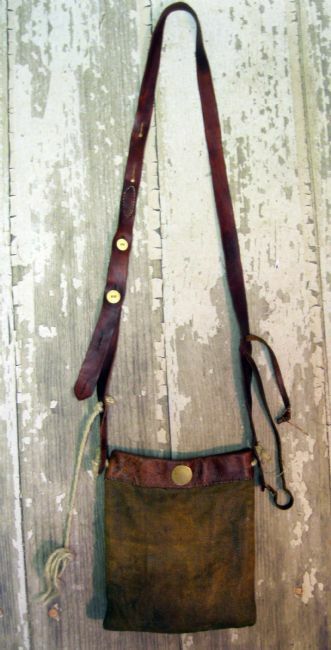 I once had an oiled holster on a light tan rough-out suede John Wayne style belt. It stained/dyed the belt where the russet holster went. I separated the two, and let the oil dissipate into the suede. Once evened out, I sprayed it with the KIWI and never had a problem again. Works wonders. I spray all of my dyed suede areas with the Kiwi. Give it a try on your straps Kudu. Maybe a couple of coats. My acceptable transfer rate of dye to clothing is 0%. That is what I strive for.